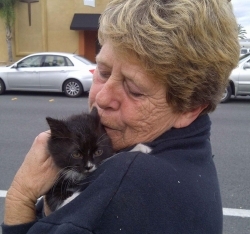 November 24, 2011 (El Cajon )—A Thanksgiving day rescue tale--or should we say "tail", has a happy ending. 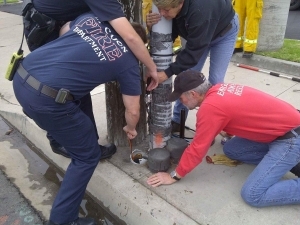 El Cajon Firefighters have saved a kitten that became trapped several feet down an old electrical plastic pipe at the corner of Washington and Avocado Avenues in El Cajon. At 4 a.m., a passerby reported hearing the frightened young kitten mewing. 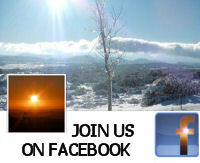 Firefighters rushed to the scene, including the Emergency Animal Rescue Team. 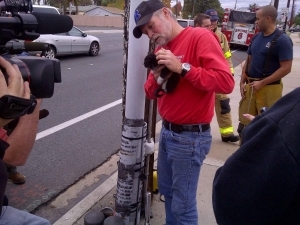 Hours later, at 11:45 a.m., firefighter Ben Jenkins used a makeshift catch pole to reach and extract the trapped animal—and plans to adopt the kitten if its owner is not found. Zech indicated that she, too, had hoped to adopt the young cat. She concluded, "I would have named it Thankful."